This connector was originally designed to be used for military equipment, but is currently used in various industrial fields. Especially, this is used in various medical equipment, electric cars, industrial machine tools, robots, etc., industrial products requiring high reliability, at a low cost. The connector is joined in a screw type, and its wires and contacts are connected in a soldering type. The class ��A�� and ��B�� types are non-waterproof products, the class ��E��, ��F�� and ��R�� types have waterproof wire parts on the rear side of the connector including insulator packing, and the class ��F�� and ��R�� types of the IS3106/IS3108 plug connector are waterproof on the front of the connector including O-rings. 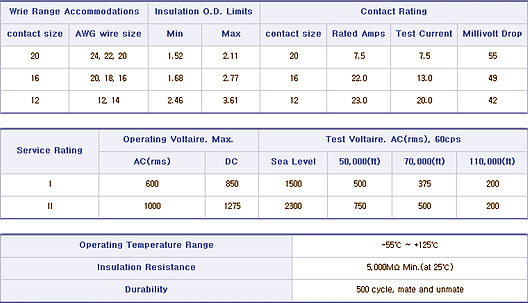 The dimensions related to mutually joining these connectors and the contact arrangement coincide with the MIL-DTL-5015 standard. BLANK - Conductive Olive Drab Chromate Over Cadmium or Zinc plate.